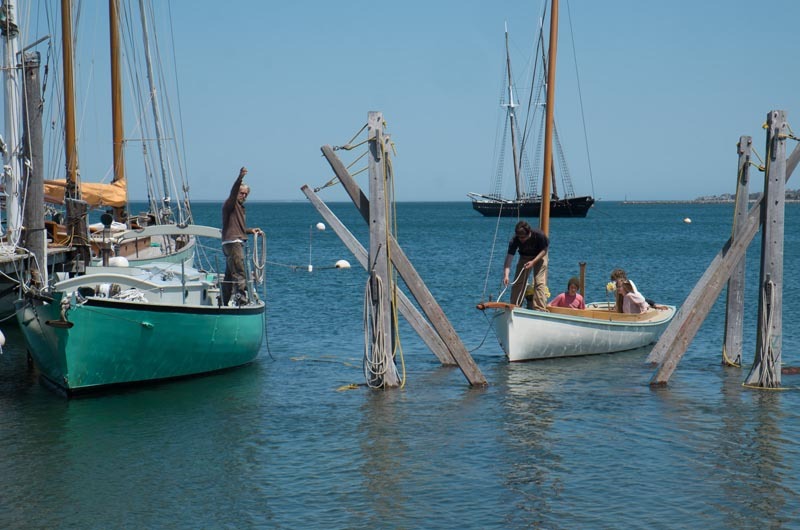 Launching Sheldrake on Vineyard Haven harbor Monday. 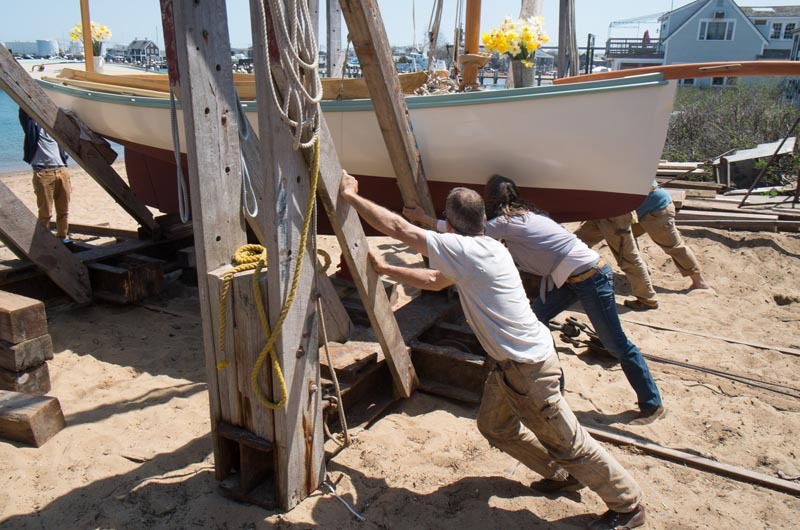 The Gannon and Benjamin boatyard on the Vineyard Haven harbor was the scene of a festive launch Monday for a new design created by the venerable wooden boat yard. The Sheldrake (the name of the boat is also the name of the design) is a gaff sloop daysailer with a clubfoot jib. She is 19 feet long on deck and about six and a half feet wide at the beam. Sheldrake is Nat Benjamin’s 85th original design. At noon Monday the boatyard was filling up with a crowd of well wishers. 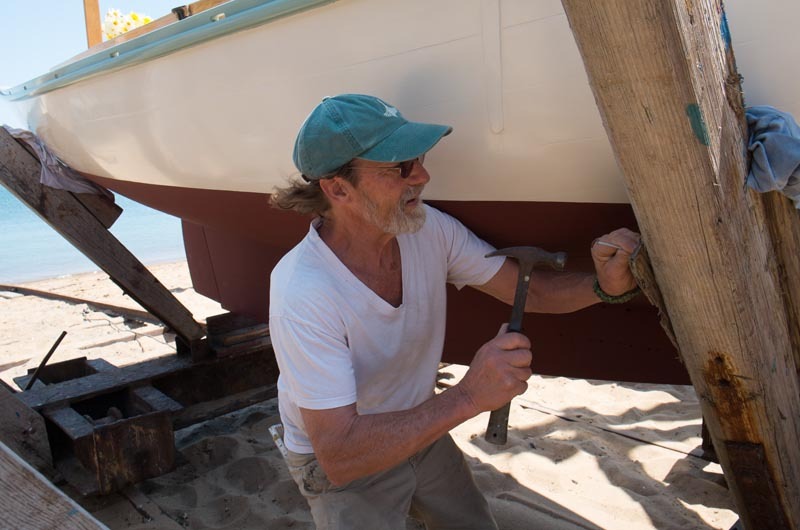 The pristine little boat rested in her cradle on a sun-splashed May day, with her off-white hull, soft sea-green rub rail, brick-red bottom paint and varnished coaming glowing a warm tan. The masts were stepped, but the sails had not been bent on. Now the old construction cradle was dismantled and replaced, piece by piece, with a launching cradle. “I think we’re ready,” said Mr. Benjamin. Greta Gannon, doing the christening honors for the owners, who could not be present, made a short speech, got a few pointers on her bottle swing from Mr. Benjamin, and said, “I christen thee Sheldrake.” It was a smash hit, and then a push to get the boat moving. She came to a temporary halt while some dignitaries — all under the age of twelve — clambered aboard. The rudder waggled once or twice, and then she was moving once again, this time gliding into her proper element. The Sheldrake was commissioned around Christmastime by Steve and Maureen Corkery, of Shelter Island, N.Y. Mr. Corkery is an experienced sailor with plenty of offshore racing and plain mucking around with boats under his belt. Over the years, they have had a number of Gannon and Benjamin boats, starting with a Canvasback, Mr. Benjamin’s first design. “The Corkerys have become more like partners in the business than clients,” Mr. Benjamin said. At 8:30 on Monday morning, last-minute preparations were under way to launch the vessel. “The idea is to bend on the sails, back out of the cradle, and sail away! It’ll be a first! But there is a lot more to do before noon to make that happen,” Ross Gannon explained. In the shed, the Sheldrake’s mast and boom were laid over sawhorses, with various lines of spliced wire dangling from it. Matt Hobart, the project leader, was working on the rigging, carefully positioning various bits of hardware and doing quick splices. He and Lyle Zell had done most of the work on the boat, “from lofting to launch,” as Mr. Hobart put it. “Myles Thurlow did the standing rigging last week,” he explained. “That has to be done first. It holds the masts in place. Then you set up the running rigging: halyards, topping lifts, lazy jacks, sheets, down hawl — everything you need to handle the sails. On the basis of the sail plan, Nat ordered the line we need. Now we are dressing the mast,” he said. A ratcheting sound filled the air as Brad Abbott worked a jack to lift the cradle enough to get logs under it so the whole assembly could be rolled sideways and positioned over the marine railway tracks. The typical boatyard smells of oil paint and turpentine are somewhat less pungent nowadays, as Gannon and Benjamin (and the industry generally) moves to latex-based paints, such as that used for the Sheldrake’s bottom paint. Sheldrake has an elegant raked transom and a plum stem — “the two features go together,” said Mr. Benjamin. Her convexly curved bowsprit, technically called steeved down, lends her a lilting look. “It’s a great little boat,” said Matthew Stackpole just after the launch Monday. A lost art. You should all be very proud! Simplistic floating art..
Plumb Stems, Raked Transoms and Steeved Down Bowsprits... All Art is Not Lost. Carry on Gentlemen! roger and amen - congrats - a beautiful thing to behold! Another gem for the wooden boat community!! Thank you , G & B and Maureen and Steve! The coming of the New York Yacht Club cruising fleet stirs never-to-be-forgotten memories.